Nashville Predators defenseman P.K. Subban celebrates another win at Bridgestone Arena. His celebrations and skill are at the heart of why fans around the NHL love to boo the all-star lightning rod. Predators defenseman P.K. Subban takes the ice for the first time, touches the puck and – immediately – boos reign down. Subban hasn’t scored a goal, hit an opponent or even taken a shot at that stage of a game, yet he’s already been cast as a villain by the opposing crowd, a target of scorn throughout the night. The scenario has repeated itself in this year’s playoffs against Colorado and Winnipeg, just as it has time and again for Subban over the years. 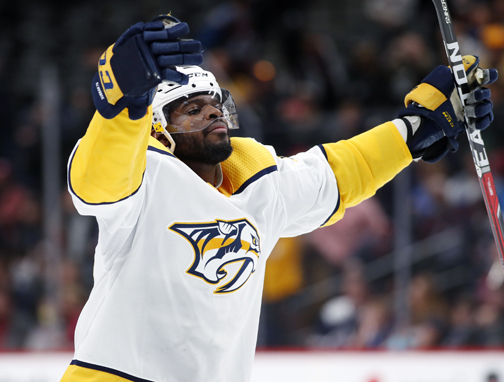 Why such an exceptionally rude reception for Subban, who’s been a huge fan favorite in the two cities – Nashville and Montreal – where he’s played during his nine-year NHL career? Part of the reason may well be that Subban is one of the game’s top players, three times nominated for the NHL’s Norris Trophy as the league’s best defenseman. Rival fans want to rattle the enemy’s stars, just as Predators fans might boo Pittsburgh’s Sidney Crosby or Washington’s Alex Ovechkin whenever they touch the puck. There’s also the theory that Subban’s flashy, emotional celebrations – whether after a goal or after a victory – rankle opposing players, coaches and fans, which leads to a reputation as a me-first player in a sport that frowns on individual expression. The 28 year-old Subban certainly doesn't seem to be impacted by the torrent of boos that wash over him during road games. He's twice been named a first-team NHL all-star, four times posted at least 50 points in a season, and has already scored twice in the Preds' current playoff series against Winnipeg. Nashville trails the Jets 2-1 going into Thursday's Game 4. But Subban does admit to being puzzled by the persona non grata label that greets him at each stop, with fans booing him almost as energetically as they cheer the home team. “In terms of a villain role, I don’t really understand that,” Subban says. “I don’t know what I’ve done particularly well (in that regard). I don’t really focus on that. It’s a lot of noise. Subban’s never been one to curb his enthusiasm on the ice, the kind of expressive personality who stands out in a buttoned-down league. In his first couple of years in Montreal, for instance, Subban and Canadiens goalie Carey Price used to exchange a “triple low-five” – both players bending at the waist and slapping hands three times – quickly following victories. But Subban’s own former coach, Michel Therrien, took the unusual step of banning the mini-celebration in 2013, declaring that any type of individual post-game routines would be replaced by a team-wide salute to the home fans. Subban’s post-goal celebrations, however, are what really seem to get under the skins of more tradition-minded opponents. When Subban slides to a knee and then simulates shooting an arrow from a bow, it drives the home fans wild with excitement. But it doesn’t play so well on enemy ice, where opposing players and fans tend to think he’s show-boating – or perhaps rubbing salt in the wound. “I think maybe if you celebrate getting an empty-netter or if you do the old bow-and-arrow when you’re a visiting team, you kind of shake your head (if you’re an opponent),” says Predators forward Scott Hartnell, a 17-year NHL veteran. To his credit, Subban owns his goal-scoring celebrations. He isn’t about to change his behavior or apologize for it, as he explained in an ESPN special on his life that ran last November. Opposing fans probably wouldn’t care enough about Subban to boo him if he weren’t having a significant effect on games. He’s a high-impact player on both ends of the rink, one equally adept at blowing a slapshot past a goalie as he is playing rough-and-tumble defense against some of the league’s best forwards. On a Predators team featuring four of the best blueliners in the game, it was Subban who was seeing more ice time than anyone else on the team through the Preds’ first eight playoff contests. “I think when you’re playing nearly half the game and you’re having an effect on the game almost every shift – as P.K. does – you’re going to draw the ire of the visiting fans,” Predators general manager David Poile says. Poile notes that plenty of other players get booed when they are in rival rinks, pointing out that Boston’s annoying Brad Marchand has been harassed by Toronto and Tampa Bay fans in the teams’ recent playoff series. It would be tough to find many players booed in almost every arena – as seems to be the case with Subban, but Poile discounts any notion that race plays into the scenario. There are about 30 black players in the entire NHL, and the league’s fan base is largely white. “No – it’s the flair he has, the way he skates, the way he acts, jumping up and down,” Poile explains. “He’s excited all the time. He’s excited when he scores a goal. He’s excited in a different way when (opponents) score a goal. Subban’s exuberance for the game, his willingness to emote and his ability to get under the skin of opponents – three traits that make him a target in enemy rinks – are three of the reasons he’s been so beloved by his home fans in Nashville and Montreal. The Toronto, Ontario, native has been one of Music City’s favorites ever since the trade that brought him to Nashville two years ago. He made a typically huge first impression, strolling into legendary honky-tonk Tootsie’s on a July afternoon and belting out Johnny Cash’s “Folsom Prison Blues” while wearing a cowboy hat. It seems easier, too, for Subban to express himself in an NHL market that’s only two decades old, as opposed to a straight-laced Original Six franchise that’s steeped in decades worth of tradition. Subban, for instance, is in charge this season of the high-tempo music the Preds warm up to just before games. And on most nights the Predators win, Subban and teammate Ryan Johansen celebrate with a quick ritual just before leaving the ice – a couple of near-dance moves followed by a slapping of hands. Unlike in Montreal, no one in the Predators organization has ever considered banning it. Subban will likely never find that kind of warmth on the road, but the non-stop boos he receives don’t appear to have hurt his game. In fact, Subban has actually scored more regular-season career goals in opposition rinks (48) than he has at home (41). It’s as if Subban simply embraces all the negative energy and feeds off it. Or, it simply doesn’t bother him. “I’m sure you (media) can figure out a solid story of why (the booing) happens,” Subban says. “But I don’t need to figure that out. The only thing I need to figure out is the scoreboard when I leave the ice.